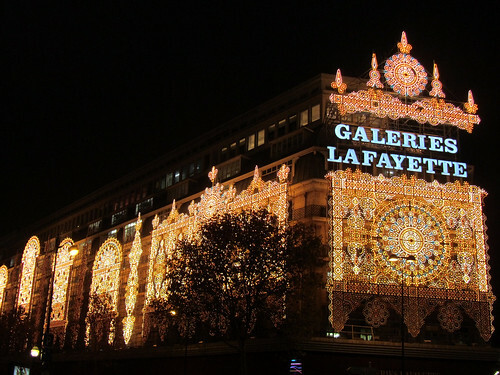 Galeries Lafayette is sitting pretty for the festive season. The main store is covered with lit motives on the outside, and it’s looking very Orient to me, both in the styling and also the colours. Sorry though it’s not particularly obvious here. The lighting comes and goes in gradient so trying to catch the whole scene is not easy. As you can see, the “hem” is already dimming and the effect moving its way up. However, if you start checking out the display windows of this grand magasin, the theme is a lot more rock’n’roll! String puppets in nearly all of them, jamming to some pretty rad tunes – totally capturing the imagination of kids and adults alike but sadly eluded mine. I’ve been expecting something elegant and bespoke (perhaps I’m reminiscing Brown Thomas’ windows in Dublin) and little dolls with crazy head bobbing to a tune is just not quite my thing. still looks great ;) many shopping complexes here are just about starting to put up the x’mas deco…a month more to go!! !